The capital market is the engine of growth for an economy, and performs a crucial role in acting as an intermediary between savers and companies seeking additional financing for business expansion. Stock market is part & parcel of capital market. Contribution of any stock exchange generally leads to economic growth by increasing the funds to finance industry and other enterprise. Stock Exchange is an autonomous body formed by shareholders/members. It can take various decisions independently. The objective of Stock Exchange is to provide a market place along with facilities for bringing together the buyers and sellers of securities, promote just and equitable principles of trade, protect the interest of the investors. Trading system is one of the most important functions of stock market operation. This report tries to find out the trading system of Dhaka stock exchange. Stock market is an essential part of capital market. Trading has now become automated, led by the Dhaka Stock Exchange through the central depository. In the present automated trading environment, bids/offers, depth, and required broker particulars are all recorded and can be retrieved for future reference. • To examine the trading system of DSE. • To know growth, development, organization and management of DSE. • To examine current issues of DSE. • To evaluate trading order and settlement system of DSE. • To identify the problems and prospects of DSE. In this study data was collected and information were tabulated, processed and analyzed crucially in order to make the paper fruitful, informative and purposeful. The report has been prepared on the basis of the experience gained during the period of the internship. To prepare the report of internship, I have collected all kinds of related data from the primary and secondary sources. There are several ways to collect primary data. Among others important one is interview. For collecting primary data I did follow interview method. There are several types of interview method. I used only personal interview method. 1 The primary data were collected through face-to-face interview with the DSE officials. 2 The primary data wee collected through participation and discussion during the trading session. 3 I had also collected information through interview with the DSE members. 4 I had collected information through interview by the questionnaire with the investors by visiting various brokerage firms. Secondary data: the study also used secondary data. For this purpose we collect information from various sources such as various publications of DSE. 1 Various publications of Dhaka stock exchange. 3 Research reports connected with the stock exchange. The study was limited to DSE to be acquainted with the stock trading procedure .we gathered information about various areas of the stock exchange, its managing procedures, working systems and environments which are very helpful to know & to increase our knowledge & to get more information and data regarding my topic “The trading system of DSE”. The information section of Dhaka stock exchange is very rich that’s why I was able to collect the required books, magazines, periodicals, journals, brochures, portfolio and the Internet facilities. 1. Due to short time, I could not collect enough necessary data about the study to prepare the report. 2. Some of key peoples of DSE were very much busy with their duties that they could seldom manage time to answer the questions. 3. Investors are not fluently giving opinion due to some restriction. 4. Researcher could not find sufficient data because of DSE great secrecy. Though the above limitations, I had tried with all of my efforts to know and find out the response pattern of the subjects and consultation of relevant record and document. Data have reached a fairly acceptable degree of accuracy. The Necessity Of Establishing A Stock Exchange In The Then East Pakistan Was First Decided By The Government When, Early In 1952.It Was Learnt That The Calcutta Stock Exchange Had Prohibited The Transactions In Pakistani Shares And Securities. The Provincial Industrial Advisory Council Soon Thereafter Set Up An Organizing Committee For The Formation Of A Stock Exchange In East Pakistan. A Decisive Step Was Taken The Second Meeting Of The Organizing Committee Held On The 13th March 1953. In The Cabinet Room, Eden Building, Under The Chairmanship Of Mr. A. Khaleeli, Secretary Government Of East Bengal, Commerce, Labor And Industries Department At Which Various Aspects Of The Issue Were Discussed In Detail. The Then Central Governments Proposal Regarding The Karachi Stock Exchange Opening A Branch At Dhaka. , Did Not Find Favor With The Meeting Who Felt That East Pakistan Should Have An Independent Stock Exchange. It Was Suggested That Dhaka Narayanganj Chamber of Commerce & Industry Should Approach Its Members For Parchase Of Membership Cards At RS.2000 Each For The Proposed Stock Exchange. The Location Of The Exchange It Was Thought Should Be Either Dhaka Narayanganj Or Dhaka. An Organizing Committee Was Appointed Consisting Of Leading Commercial And Industrial Personalities Of The Province With Mr. Mehdi Ispahani As The Convener In Order To Organize The Exchange. The Chamber Informed Its Members And Members Of Its Affiliated Associations Of The Proceedings Of The Above Meeting, Requesting Them To Intimate Whether They Were Interested In Joining The Proposed Stock Exchange. This Was Followed By A Meeting, At The Chamber Of About 100 Persons Interested In The Formation Of The Exchange On 07.07.1953. The Meeting Invited 8 Gentleman To Become Promoters Of The Exchange With Mr. M Mehdi Ispahani As The Convener And Authorized Them To Draw Up The Memorandum And Article Of Association Of The Exchange And Proceed To Obtain Register Under The Companies Act.1913. The Other 7 Promoters Of The Exchange Were Mr. J M Addision-Scott, Mr. Mhodammed Hanif, Mr. A C Jain, Mr. A K Khan , Mr M Shabbir Ahmed And Mr. Sakhawat Hossin. It Was Also Decided That Membership Fee Was To Be Rs.2000 And Subscription Rate At 15 Per Month. The Exchange Was To Consist Of Not More Than 150 Members. A Meeting Of The Promoters Was Held At The Chamber On 03.09.1953 When It Was Decided To Appoint Orr Dignam & Co., Solicitors To Draw Up The Memorandum And Articles Of Association Of The Stock Exchange Based On The Rules Of Stock Exchange Existing In Other Countries And Taking Into Account Local Conditions. At The Time Of Incorporation The Authorized Capital Of The Exchange Was Rs. 300000 Divided Into 150 Shares. Of Rs. 2000 each and by an extra ordinary general meeting adopted at the extra ordinary general meeting held on 22.02.1964 the authorized capital of the exchange was increased to Tk. 500000 divided into 250 shares of Tk. 2000 each. The paid up capital of the exchange now stood at Tk.460000 dividend into 230 shares of Tk. 2000 each. However 35 shares out of 230 shares were issued at TK. 80,00,000 only per share of TK. 2000 with a premium of TK. 79,98,000. Although incorporated in 1954, the formal trading was started in 1956 at Narayanganj after obtaining the certificates of commencement of business. But in 1958 it was shifted to Dhaka and started functioning at the Narayangonj chamber building in Motijheel C/A. On 1.10.1957 the stock exchange purchase a land measuring 8.75 Kattah at 9F Motijheel C/A from the Government and shifted the stock Exchange to its own location in 1959. Listing of Companies. (As per Listing Regulations). Providing the screen based automated trading of listed Securities. Monitoring the activities of listed companies. (As per Listing Regulations). Investor’s grievance Cell (Disposal of complaint by laws 1997). The Dhaka stock exchange will create a successful well-organized and transparent market of international standard to save and invest in Bangladesh in order to facilitate the competent entrepreneurs to raise capital and speed up industrial growth for overall benefit of the economy. 1 To develop a strong platform for the entrepreneurs for raising capital. 2 To provide an investment opportunities for small and large-scale investors. 3 To develop a transparent market ensuring investors interest. 4 To provide a fully automated trading, Clearing and settlement system to ensure quick, easy, accurate and easily accessible to all transactions. 5 To attract non-resident Bangladeshis to invest in Bangladesh Stock market. 6 To attract foreign institutional investors to invest in Bangladesh stock market. 7 To collect, preserve and disseminate data and information on stock market. 8 To develop a corporate culture through mandatory corporate membership. 9 To develop a research cell for analyzing status of the market and economy. Association and e) Settlement of Transaction & Regulation.  The National Parliament passed “The Depository Act, 1999” on the 5th of April 1999.  SEC adopted “ Public Issue Rules 1998” which was gazette on the 25th January 1999 and subsequently brought some amendments in this rule on the 28th April 1999.  SEC has approved the “Margin Rules 1999” to facilitate proper administration of credit facilities extended by the brokers to their clients and to enhance liquidity in the Exchange.  The cabinet on June 7th, 1999 approved the amended to the “Trust Act 1882” to facilitate the investment of 25% of pension and insurance funds in the capital market.  SEC has extended the time limit for brokers/dealers to continue underwriting business from 30 to December 31, 1999.  SEC amended the “Securities & Exchange Rules 1987” with a view to removing the “Counter Party Identification” facility from the trading of the Stock Exchange.  SEC amended the “Settlement of Stock Exchange Transactions Regulations 1998” envisaging stern measures against defaulters for failing to deliver securities or make payment within stipulated time.  DSE has a policymaking Body of 24 members, of whom 12 are elected and 12 are selected councilors. DSE has the following committees are working in DSE for smooth running of the organization.  Land and Building Committee. Every company must be listed in the Stock market for working thereon and they have to fulfill various formalities. The Listing and Membership department deals with the various formalities of listing and membership with DSE. Formalities related with the enlistment of a company and membership and discussed in below. If the companies willing to expand their market may apply for listing with the DSE, according to the manner prescribed in the Listing Regulations. ‘Listing Company’ means a Company or a body corporate or corporation, which has been listed in accordance with the regulations, and whose securities are listed and include provisionally listed companies. Unless the company or the securities have been listed and permission for such dealing has been granted, no dealings in securities of a company shall be allowed. The Company has to be a Registered Public Ltd. that must be incorporated in Bangladesh under the Companies Act.1994 with the office of the Registered of Joint Stock Companies and Firms. Shares to a listed company can be issued through primary market or secondary market. Application for listing in the stock exchange should be made as per Form 1, under Section (9) of the Securities and Exchange Ordinance -1969 Section 140 of the Companies Act. 1994, within 10 days from the date of publish of the Company’s prospers. The stock exchange shall grant permission within a maximum period of 3 months from the date of receipt of listing application. In case, the permission is refused, the reason thereof will be communicated to the applicant and also to the Securities & Exchange Commission within 2 weeks of the decision. If reused, the applicant may move a fresh application after six months from the date of such refusal unless the Board otherwise decides. 1. In case of Participatory capital, a copy of the trust deed. 3. A Memorandum and Articles of Association. 8. Or between Vendors, Promoters, Underwriters, Brokers. 10. Managing Director and Technical Director. 11. A statement containing Particulars of material contracts. 14. Form 2 as printed in the listing regulations. 15. A deed of Unconditional Undertaking to abide by the listing regulations of the DSE. a) Dealer: They can act as principal any buy for their own accounts and sell securities from their own inventories. b) Broker: They act as agents of others and receive a commission from their clients. They have no rights to buy or sell from their own inventories. The same firm or individual member may act as either a broker or a dealer at different times and in different transactions in the secondary market. • Memorandum of Association, Articles of Association of the company. • Letter regarding permission for on-line trading. • Deed of Declaration as per clause 5 (b) of General Rules and regulations of DSE. • Two copies stamp size recent photograph.  In case of disclosure of news in any scrip, the circuit breaker percentage will be changed to a Market Operations specified value and will persist at this value for a specified number of days.  For new scrip, for specified number of days after the first trading day, the percentage is a Market Operations specified value. Till the first trading day for that scrip, there will be no circuit breaker percentage.  In case of book closure, the Exchange will provide an absolute value of circuit breaker, which will be used for a Market Operation specified number of days, following which it will revert back to the old value of the circuit breaker. When price rigging can’t be controlled even after applying the existing surveillance measures or if any serious irregularities such as large quantity of bad deliveries, circulation of fake share certificates in the market etc. is noticed in the market Exchange can suspend trading of those scrip for a period depending on the situation. Surveillance Department of the Exchange on a day-to-day basis carries out a thorough study of the trading pattern of the top 10 scripts by turnover. Such analysis covers the price, turnover volume and value activity by various members in each of the scripts and also the fundamentals of the Company. As per the instruction of SEC circuit breaker is not applied to the newly listed shares for the first five market days. Trading pattern in this five days of the newly listed shares are analyzed by this department to detect whether the members have entered into any manipulation or circular trades to artificially prop-up or prop-down the prices. If any certain irregularities are observed, the Disciplinary Committee takes action against such member. Depending on seriousness of irregularity noticed in a member’s trading, his/her trading terminal is suspended until such time the issue is resolved. • Watching net high-low position. • Investigation into specific deals of Broker/Dealers. The surveillance functions are conducted through the surveillance module of the computer system. This system usually runs manually. The surveillance department through its wide information source carries out this function. 1 Regular Inspection – In a regular inspection, the inspectors check whether the brokers are maintaining all the books of accounts. 2 Spot or Special Inspection – In this sort of inspection the inspectors make a surprise visit or it is done on a particular item. 1. Checking whether the brokers are maintaining rules and regulations under SEC, company act, and income tax law. 2. Making physical visit to the broker houses as per the command of SEC or Surveillance department of DSE. I. Familiarity of the directors. ii. Who are holding the shares (Foreign or local or corporate investors.)? iii. List of top executives. iv. Factory size, product type etc. v. Credit rating of the company as per various credit rating agencies (for example–CRISL). 4. Preparing internal report and forwarding to SEC if needed. 1) To maintain technical soundness for the entire DSE. 6) To store and Print out all data. 7) Information providing to various departments. 8) To advise the brokers about their technical difficulties.  Central Server/Status C400 series.  Fault tolerant continuously available.  16 GB Hard disk.  512 KB Cache Memory.  OLTE (Optical Terminating Equipment).  Data Storage………….. DAT (Digital Audio Type). • RDBMS (Relation Data Base Management System): Sybase. 1) Network covers Dhaka, Dhaka and Sylhet. 2) Dhaka-Dhaka is connected through VSAT and Bangladesh T&T leased line as Back-up. 4) E1 line, High Speed Optical fiber is used in the Network. d) To clear and settle the transactions. e) Automatic buying in and selling out. Dhaka stock exchange has a department for working with the accounting and financial aspects. This department consists of expert personnel including F.C.M.A. etc. The main function of this department is to maintain the proper books of account as required by law. The accounts are being prepared according to historical cost convention following generally accepted accounting principles. At the end of financial period, this department prepares Income and Expenditure account, Cash flow statement and also a Balance Sheet for the projected year. Research & Development are essential pre-requisites for effective functioning and development of any Stock Exchange. Dhaka Stock Exchange has R&D, Library and Public Relations department. This section deals with the functioning of this department. Research is a foremost necessity for any stock exchange. In order to fulfill the need DSE has established a Research Center and are keeping close contacts with the UN bodies, international research organization, etc. This department has been publishing a monthly bulletin “PORTFOLIO” It was earlier published in the name of “market update” This monthly magazine is being distributed to the concerned persons and agencies including Bangladesh Missions abroad, Foreign Missions in Bangladesh, Stock Exchange-Worldwide etc. in addition to the transaction data analysis, Portfolio carries in depth analysis, interpretative write-ups on the share markets, investments, capital flow and formation and the state of the economy in general. DSE also envisages publishing fact book, booklets on trading rules, clearing & settlement rules etc. Dhaka stock exchange has also established a specialized library for the use of the operators of the money market. The country Director of the World Bank Resident Mission in Bangladesh, Mr. Pierre Landell-Mills, officially inaugurated the DSE library. At this library, international newspaper, journals, stock market book & publications, information of listed companies, CD ROM, videocassettes for learning on various management tools and on foreign stock markets etc. is available. • Knowledge about capital market etc. At present 1000 books are available at this library. These books include Finance, Management, Accounting, Stock Market, Economics, and Statistics etc. Beside these books, half-yearly and annual report of various listed company; World Bank’s publications relating to the economic survey of Bangladesh are also available here. DSE has already opened a Home Page on the Internet (www.DSEbd.com) for releasing updated market information. At this Home page Organizational History of DSE, Rules & Regulations of DSE, Foreign Investor’s incentives, Members’ list, listed company’s information, Daily market Statistics (be updated in every one hour) are available. The main function of this section is to increase the public awareness by providing various information to the general public through Press News, T.V. coverage, Newspaper etc. Another function is to arrange Seminar and Workshops. DSE has been organizing seminars and workshops at home and abroad for the benefits of the investors. Approximately sixty Seminars and Workshops have been held in the country and twelve seminars and workshops have been held abroad organized for the non-resident Bangladesh in Washington, New York, Mecca, Medina, Jeddah, Dubai, Tehran, and London etc. The stock market is one kind of capital market where the stocks are of the different companies are traded. DSE, floor trading was started with open cry-out auction system. Now trading has become automated, led by the DSE through the central depository. In the present automated trading environment, bids/offers, depth, and required broker particulars are all recorded and can be retrieved for future reference. Initial public Offer (IPO): Initial public Offer (IPO) means first offering of security by an issuer to the general public. • Collect B/O Account opening form from a depository participant. • Fill it up, sign it, enclose to recent color pp size photograph and photocopy of nationality certificate / passport and a certificate from the manager of the bank account. • Submit it to the concerned DP along with charges. • The DP will input your data into the online server of CDBL. We will get information from newspaper, stock exchanges, broker offices, web sites of SEC, DSE and the issuers, also from DSE publications. • Collect IPO application form from DSE or its broker offices Bankers to the issue. • Fill it up, sign it. • Submit the form along with the subscription money to the selected bank. • Collect the banker’s acknowledgement. If your application is successful in the lottery, the issuer shall deposit your shares in your concerned B/O account. If not successful in the lottery the issuer shall refund your subscription money by account payee Cheque or warrant payable to applicant. Then you have to deposit the refund warrant to your bank for clearance. Thus your money will be returned. So there is no loss in the IPO. Check the B/O account and take a statement of holdings. Now, one can sell the shares or hold it. If you sell it, get capital Gain, if you hold its price may rise and may get dividend or stocks.  Estimated profit and cash flow.  Company’s sponsors have good financial track record and are not loan or tax defaulters.  Share issue price is as per net asset value and present income based value.  Has the company long-term loan from BSB and BSRS?  Any foreign investor’s portfolio in the company. This is well known as stock exchange, is a secondary market – a trading market. It is structured to provide liquidity and marketability to the security industry. It is a market where you can buy and sell stocks. • How can I start? • What to know before investing? • How DSE helps you? • Observe first and study the market. • Place your buy / sell order. • Get buy / sell confirmation. • You can hold it or sell it if price increases. • If you hold it you may get cash dividend or stock dividend. Fundamental analysis is the process of looking at a business at the basic or fundamental financial level. This type of analysis examines key ratios of a business to determine its financial health and gives you an idea of the value of its stock. Many investors use fundamental analysis alone or in combination with other tools to evaluate stock for investment purposes. The goal is to determine the current worth and more importantly, how the market values the stock. c) Not otherwise barred by DSE of SEC. Companies, which are regular in holding the annual general meetings but have failed to declared dividend at least at the rate of tem percent in the last English calendar year. Companies which failed to hold the current annual general meetings or have failed to declare any dividend or which are not in operation for more than six months or whose accumulated loss after adjustment of revenue reserve, if any, is negative and exceeded its paid-up capital. G- Category Companies are basically Greenfield companies. The companies, which are not, started its operation but call subscribers to invest to their Company. They basically call for capital in primary market. The Company’s, which are already in operation and enters into primary market to collect money, falls into N- Category Companies. Before starting on-line trading system, at the Dhaka Stock Exchange, trading was conducted through Cry-out system. Under this system, Members and their Authorized of the Stock Exchange who have license to trade from the Securities & Exchange Commissions would come to the Stock Exchange Floor and participate in trading. But there were a number of shortcomings of this trading system. a) Cry-out floor trading was inept and slows down the process of finalizing deals on the stock exchange floor between the stock dealers. b) There was a common complaint from the investors that, they didn’t get fair price. They didn’t know what actually happened on the floor. They had to depend on the broker and it was the market for the brokers not for the investors. To get rid of this problem, a new system is required to be developed. c) Manual Clearing and settlement system is clumsy and slow causing an affliction in stock exchange settlement department and ultimately limiting the trade volume and transactions. d) Participation in the Stock Market remains restricted within a community residing close to the Stock Exchange building. The business can’t be reached out the common mass. e) Cry-out system was a noisy manual system; the open floor action was not only messy and tiring for the traders, but also difficult for the Stock Exchange to monitor the transactions as required by the rules and regulations. f) The manual system was error-phone. Errors were very difficult to detect in the current system. To get rid of these difficulties, it was very essential at that time to start on-line trading i.e. Screen based trading system. On-line trading is automated by computer application. Globally the developments in information & communication technologies (ICT) have created a new instance in the securities market operations. Stock Exchanges all over the world have realized the potentiality of ICT and inclined to the electronic trading systems. It was understood by DSE that technology would ensure transparency, timeliness and satisfaction in customer service. Considering those DSE introduced Automated Trading System on 10th August 1998.In other words, the trading floor moved right into the member’s office premises where an investor started to place buy/sell orders. DSE Automated Trading System (HP Nonstop S7804) is running on fault tolerant, high available, scalable and maintainable Mainframe Server. Previously DSE established the TANDEM Nonstop K204 System on September 1998 and on August 2005 it was replaced with highly scaleable HP Nonstop S7802. DSE upgraded the Trading System again on 21st December 2008. The existing HP Nonstop S7804 Server is highly fault tolerant to the fact that no single component failure will halt the system. Its constituent parts are hot swappable, and upward compatible; components can be added or removed while the system is running and any compatible new upgraded will work with the system. All disk drives are mirrored so, if any of the disk crashes the exact copy of the data is available at online. Moreover the connecting path for every disk whether it is primary or mirror is also redundant. In every case, minimum two peripheral devices exist. All the components are working active – active load balancing procedure. To ensure better power quality we have ensured high end UPS’s with long durable backup capability, two instant backup generations and other electrical devices. All The Member (230 members) Server Applications (MSA) are connected with Nonstop HP S-Series Server through either DSE LAN or WAN connectivity. Each member has one or more Trader Work Station (TWS). The TWS,s are being connected to the Trading Server via respective MSA through LAN and WAN connection. DSE outsourced Metro Net Ltd., DNS Ltd. , X-Net Ltd., Dhaka Com Ltd., Ranks ITT, Link-3, Royal Green Online Ltd. etc Network Service Providers (NSP under WAN Expansion Project. Now a days members can establish a main office or branch offices to their remote location and can trade smoothly by using different media ADSL, Optical fiber and Radio Link from Dhaka and other important cities such as Gazipur, Narayanganj, Comilla, Hobiganj, Dhaka, Sylhet, Khulna, Barisal, Rajshahi, Bogra at the same time. Two DSE branch offices located at Dhaka and Sylhet is connected via BTTB’s DDN link. We also used another connectivity for redundancy for the DDN link. We have a plan to reach the DSE branches in same way. In case of trade interruption due to serious hardware, software, network failure or telecommunication disruption at the Brokerage houses, there is a provision to allow traders to trade at DSE Contingency Trading floor. The system software is HP Proprietary Nonstop KERNEL and includes the database as part of the operating system thereby eliminating the layer typically found in most Database Management Systems (DBMS). NONSTOP SQL handles the Database functionalities, which is simply a different operational session for the operating system. The proprietary nature of the system software arguably enhances system security. DBMS handled by Nonstop SQL. The system software treats all its hardware resources as objects and is thus entirely message driven. This then allows application software to be deployed using client / server architecture providing shared data processing between the central server and the user workstation. The central trading system resides in the Stock Exchange premises, which is running 24 hrs in a day & 365 days in a year. TESA software is built for the global securities markets. It uses fault tolerant computers, intelligent workstations and client / server design techniques. This provides co-operative processing, high message integrity, continuous operation and fully automatic recovery. This co-operative mechanism enables very high speed processing which is essential for today’s electronic markets. TESA’s Application Programmatic Interface (API) is the gateway to the TESA system from the outside world. All external devices connect through the API. The API provides the translation between external devices and internal processes. This means that a new process does not need to be written to support each new device, only the API needs to be modified. The TESA application suite derives significant advantages from being implemented on the HP Nonstop platform. The HP Nonstop customers have benefited from these advantages. Fault Tolerance: One of the most important automation requirements for any stock exchange system is continuous system availability. With most systems Fault Tolerance is created at the application level. Fault Tolerance is a fundamental design feature of the HP Nonstop architecture. Data Integrity: Data integrity is an integral feature of HP architecture. TESA employs standard HP tools to achieve exceptional data integrity. Scalability: The ability of an exchange to accommodate extraordinary increases in transaction volumes without loss of its Capital investment in automation is very important. The HP Nonstop Server is massively scalable due to Parallel processors. Client / Server: TESA’s Client / Server architecture enables an efficient allocation of computing resources and provides easily modified user-friendly interfaces. TESA workstations operate under Windows 95 and can function either as servers on a broker’s network or as workstation. The brokers use these to perform trading and settlement activity. Market Information: Supplying all market information needed to formulate the buy and sell decisions. Order Management: Accept, validate and store orders and quotes from broker workstations and / or systems. Order Execution: Automatically executes orders when buy and sell prices match. Trade Reporting: Trade execution reports are provided to each trade participant, to the settlement system and / or the depository and to the market. Market Access: Provide exchange members with efficient affordable GUI-based tools for accessing the market. Enquiry: Market will be closed in this session & other facilities like the previous enquiry session. The Market Control Workstation allows the exchange administrative staff to control the operation of the market, e.g. Session Control: Opening and closing the market via interactive control or by preset timers. Validation Parameters: Setting and viewing parameters that control the trading engine validation e.g. tick size, Circuit Breaker, Circuit Filter, Market lot, Price protection Percentage. Messaging: Allows the dissemination of company announcement data and general market administrative massages. Collecting Real-Time Market Information: Bids, offers, last sale (i.e. most recent trade price and volume), book and other data are gathered via the Trading engine. It supports TESA’s automated and manual trading modules and can process the trades of external and off-market systems. Collecting company Information: All information supplied by the listed companies is maintained in the TESA database. Generating Market Statistics: TESA generates market indices on a real time basis. It generates other statistical information such as Price. Research and Enquiry: this module provides brokers access to the local Broker Support and TESA databases for enquiries and research purposes. The multi-windows environment allows users to simultaneously view orders, market and trades. Broker Support offers Stock Exchange members two configurations; standalone and multi-user. Both configurations maintain a database consisting of information generated by the TESA Server and the local system. Dhaka stock exchange appointed an internationally reputed consultant. International Securities Consultancy (ISC) was selected following scrutiny of proposals. The primary task of the consultant was to produce a full Request For Proposals (RFP) for establishing the Dhaka stock exchange’s trading system. The RFP detailed the current system, the need and the possible barriers to solving the problems. Thereafter, an international tender was floated. Finally, in June 1997, two MOU (Memorandum of Understandings) was signed with tow vendors CMC of India and bell core of U.S.A. for design and implementation of Dhaka stock exchange’s automated trading system. CMC (Computer Maintenance Corporation) commenced its operations in October 1976 to service all installations left by IBM, CMC’s activities have advanced in many new directions. It is now one of the leading system integration in the country with multi-faceted expertise in information technology. CMC Limited had automated a dozen of bourses. Bell core International of U.S.A. has played a central role in developing America’s fines tale-communications service. Bell core is the only company in the world that offers end-to-end network expertise combined with the vendor neutrality. The Brokers Workstation module be available from each broker’s office. This module provides the facility to view the market scenario and input order. The Market Operation is exclusively for the trading department of the Exchange issues like this department handles disclosure and circuit breaker. The surveillance department of the Exchange will use the third module. This module facilitates on-line surveillance adding a new dimension to the issue of overseeing the market in this country. Internet Trading System (ITS) is DSE venture on behalf of the brokers. This site has been provided by the Dhaka stock exchange so as to give customers the convenience to trade or put orders on DSE from anywhere in the world irrespective of the trading hours of the stock exchange. The trading is done by registering on the site under some existing broker of the stock exchange. Register on the site as an investor. 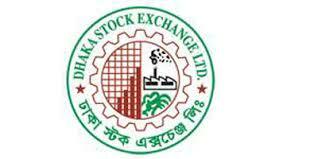 It is necessary to register under some existing broker/sub broker in the Dhaka stock exchange. For additional security there are two passwords, browsing password, which is reduced every time, a transaction like order entry, modification etc. is made. Trading can begin only after the respective broker has approved the registration and assigned limits for trading. The investor can do trading during the trading hours of DSE as well as put offline orders during the non-trading hours, which get added into the system in the next trading session. The investor can trade only unto the limit assigned to him by his broker. On exceeding this limit the investor gets suspended. The objective of ITS is to spread the capital market of Bangladesh begun the larger cities of the country. Through this system, you can witness the market scenario on the internet and place buy/sell order through your broker concurrently. Usually stockbrokers make their own website interactive for their clientele. Here DSE itself is offering the service on behalf of the stockbrokers. Choose your broker we provide. We treat all members equally. If you ask which broker to open an account with? Our answer is it is your choice. The stock exchange will make your broker liable for settlement of your trades. So naturally they will be careful extremely to set your trade limit. Check with your brokers to make sure you have sufficient funds and shares deposited with your broker. Otherwise your order will bounce back invalid. Agreement with a broker: As an individual investor you need to upon on accent with a broker. When you are willing to use Internet Trading facilities, you will need to fill in a special ITS account opening form. The terms and conditions to be followed by you and your broker for ITS, will be little different from the regular trading account. All brokers are not eligible for ITS. Please see in the relevant section of this website or e-mail to us for a list of brokers who can offer you ITS. Although the form is available on the net, you still need to fill in and submit to the chosen broker a hard copy of the form duly filled in. When you open an account, your broker will prepare your electronic file. Your life will be accessible to you only. You will be given a password. When you will be able to fill in the account opening for electronically, you yourself will set the password. But it your product a hard copy to your broker who will key-in your data for you, the password will be set by the brokerage house staff. We strongly recommend you to change your password immediately and from time to time for better security. Remember, if you give your password willingly or unwillingly, he or she can place order and nobody but yourself will be liable for all those transactions. Make sure that you and your broker have signed the safe beeping agreement. Once you have the safe beeping agreement you can deposit shares and money to your broker. According to your deposit, the broker will set limit to your trade. Odd lot orders can be entered as limited orders with the order quantity always not multiple of market lot for that scrip. These orders would be matched with their counter orders if the quantities match and prices allow for a match to take place. Odd lot orders can be entered for any scrip in the system. Odd lot would be similar to the normal order in a given mode of trading. Only limit orders are permitted with a special odd lot indicator with the order. The priority employed for matching these orders would again be the price in that order. Auctions will be orders entered by the Stock Exchange. There will be a separate Auction session for entering these orders. Before the start of the auction session, Stock Exchange is supposed to have entered all its auction orders. Auction session can be of two types viz. This parameter can be set by the Stock Exchange. In open auction session the solicitor brokers can view other solicitor orders in the market. In Close auction the solicitor brokers cannot view other solicitor orders in the market. Thus, the solicitor brokers are allowed to remove or modify their orders in close auction. 1 The Stock Exchange will decide whether the auction is of ‘Buy’ or ‘Sell’ type i.e. whether the Stock Exchange puts Buy Orders or Sell Orders. This is also a parameter that can be set by the Exchange. 2 Stock Exchange enters details like Scrip, Auction Order Quantity, Standard Rate, Broker Code for whom auction order is being entered and Defaulter Broker Code. 3 A cumulative auction quantity and standard rate in each of the scrip will be broadcasted to all the brokers when the auction session begins. 4 During the auction session the traders can only the opposite orders (solicitor orders) for the auction orders entered by the stock exchange. 5 A Broker who is a defaulter for any order entered by the Stock Exchange will not be allowed to place solicitor orders in that scrip. 6 The Stock exchange will specify a standard rate for each of the scrip when putting the auction order. 7 The system will then the matched solicitor orders as auction traders to the concerned traders. 8 The auction orders entered by the Stock Exchange cannot be modified to delete once the auction session has started. 9 The auction trades currently are not taken into account for updating the positions of the traders and brokers. 10 All unmatched solicitor orders are removed from the system at the end of the auction session. Else Close out rate = (Standard rate X Close-out %) 100. Spot Orders are normal orders for which delivery has to take place on the same day. The scrip in which spot trading is to be allowed is decided by the Stock exchange. 1 A spot order is traded against another spot order only. 2 Priority of spot order depends on its price and time. 3 A trader can submit multiple spot orders in the same scrip. 4 Spot Orders can be modified or removed before they are traded. On modification, the spot order loses its time priority. 5 The Spot BBO is formed of spot orders only and is shown separately. 1 Bulk orders are essentially limit orders used for trading in larger quantities. They are also referred to as block deals. 2 Bulk orders will be accepted in the continuous trading session only. The duration of these orders would be same as that existing for limit orders. 3 Bulk orders will not be considered for BBO formation and closing price calculation. 4 All other conditions of client code, tick price, filter limited etc. are applicable for bulk orders similar to the ones applied for normal orders. 5 Bulk orders entered by the broker/trader will be broadcast to all the BWS’s. The trader can view the bulk orders and place the appropriate opposite order. This type of orders is almost similar to the Bulk Orders, Except that the Multiplying factor will be a global system parameter, set to a value of 2 by default. All other rules pertaining to bulk order trading apply here also. Circuit breakers are checks enforced by the system to verify that the volatility in the market is controlled. Circuit breakers are cheeked at matching stage or at order entry stage. The time at which circuit breakers have to be checked can be specified by the Stock Exchange as a parameter. 1 In case of new issue, free trade may be allowed for first 5 (five) consecutive market days and after that, above limits will be applicable. 2 In case of receipt of any price sensitive information like declaration of dividend, bonus/right issue, expansion or joint venture news etc. from the listed company, free trade may be allowed for subsequent 3 (three) market days, and after that, above limits will be applicable. 3 The SEC from time to time in order to ensure orderly markets and also to address the practical aspects may review the above guidelines. 4 Share prices are controlled by the trading system automatically according to the above guidelines. CDBL was incorporated as public limited company on 20 August 2000 to operate and maintain the CDS. Shares have been exchanged between sellers and buyers just like other commodities since the starting of stock exchanges. The old tradition of exchange of shares has been with physical certificates. The transfer of ownership of shares between sellers and buyers has therefore been affected through a process of executing transfer agreements between sellers (transferors) and buyers (transferees), verification of seller’s bona fide ownership of the shares with the companies, and then followed by payments and lastly cancellation of seller’s certificates by companies and issuance of new certificates to buyers. That is to say, for a shareholder to sell his shares, he must possess a physical share certificate issued to his by the company. The global stifling of trade in Stock Exchanges created a worldwide concern over the necessity to invent newer ways of security transaction to ensure the development and the enhancement of capital markets. As a result, a group of economic and financial experts and intelligentsia, known as the G-30 came up with a historic recommendation of setting up a central depository to facilitate the settlement of stock trades through the method of Electronic Book Entry Transfer. Its aim was to eliminate the risk and problems caused by the cumbersome process of physical transaction of shares. Based on their recommendation central securities depositories were set up in various countries all around the world including most of our neighboring countries like India, Pakistan, and Srilanka in private sectors. The new automated Screen-based trading system in Dhaka stock exchange is replaced by saying good-by to the traditional cry-out system. Unlike other automation project, this is not just computerization of the trading floor with the typical data itself. Leading Stock Exchange who had already automated the transaction operation of their trading floor is gradually moving towards this relatively new technology of screen based trading. Dhaka stock exchange has accomplished this trading system from their own resources. The following are the main impact of Dhaka stock exchange’s automated trading system. By introducing automated trading system, transparency has been ensured. At present, everything is going on manually. No manipulation is possible by this system. This system ensures easy and quick communications between traders and the investors. In the traditional Cry-out system, scripts were traded one at a time. Although, trading lasted for a few hours, practically one scrip gets only a few minutes to be dealt in. The main facilities offered by automation, are placing of orders both on-line and off-line. Brokers workstation-located in their office premises-allow investors to trade each and every scrip throughout the business hour. The wide area network of Dhaka stock exchange that virtually links the entire Bangladesh through the normal phone system, also promise a wide participation of the investing public. Not only that, with an efficient network, the overseas investors can now access the market which is very important for the Bangladesh market as the huge number of the citizens are living abroad and willing to invest in this country. Due to Starting of automatic trading system, fake share transaction has almost been minimized whereas; it was a common issue in the Cry-out system. In that traditional system, there was an existence of curb market. Investor’s buy/sell in those curbs market to avoid commissions payable to the market. As a result, much fake share would have been transacted. After commencing operation through screen based trading system, existence of curb-market has been abolished and transaction of fake-share has been reduced. Under this new system, Authorized Assistant of each member deposit/receive the securities to/from the clearing and settlement department of the Dhaka stock exchange. The investors make no handling of shares or securities directly. Proper monitoring is possible under the automatic trading system; proper monitoring is possible through surveillance software module. At Dhaka stock exchange, surveillance department monitors the overall trade situation by using this computer system. Also, it had a terminal installed at Securities and Exchange Commission’s (SEC) for the inspectors to keep the vigil. When deals are executed through super fast machines, it is bit difficult for human being to do the monitoring at the similar pace. Stock Exchange activities are very specialized in nature and as such, human resource in this area is scarce in this country. Keeping this in view, Dhaka stock exchange has given priority to the development of its human resources. A Term of Dhaka stock exchange participated in the Asian Securities and Investment Automation Congress (ASIAC) ’97 held on 28-30th May 1997 in Kuala Lumpur, Malaysia. Another term of executives spent two weeks with CMC & some Stock Exchange in India to undergo OJC (On the Job Trading) on automated trade. All members agree that the automated trading system gives the investors the assurance that, they are getting their dues and that the brokers will not be able to play with their money. This feeling is gradually restoring investors’ confidence. It is really a matter of great pride and Pleasure that, Dhaka Stock Exchange became the Stock Exchange among as many as 31 bourses on the Sub-continent to have automation facility. By introducing new developed system, transparency has been ensured and investor’s confidence will definitely lead to the return of the investor, which has probably begun to happen already. At that situation, a huge amount of the capital will be formed in the country, share price of listed company will go up, total GDP will increase and ultimately the whole economy of the country will be benefited. Thereafter, we can say that, automation has a great impact on the overall economy of the country. Simply stated, a Central Depository can be compared to a bank. A central depository holds shares of shareholders in book entry form. Thus it acts like a bank of shares, by depositing share certificates into a central depository, the delivery of shares in settlement of a transfer of shares executed between a seller and buyer can be easily achieved with change of records in the central depository instead of physically exchanging certificates, as has been the case till now. Central Depository Bangladesh Limited (CDBL) was incorporated as a public limited company to operate and maintain the Central Depository System (CDS) of Electronic Book Entry, recording and maintaining securities accounts and registering transfer of securities, changing the ownership without any physical movement or endorsement of certificates and execution of transfer instrument, as well as various other investor services including facilitation of the secondary market trading of Treasury Bills and Government Bonds issues by the Bangladesh Bank. The Register of Joint Stock Companies (RJC) issued the certificate of incorporation and certification of business commencement to CDBL on 20 August 2000. The Authorized and Paid-up-Capital as Tk 500 million and Tk 300 million respectively with the value of each share is fixed at Tk. 01 million. The objective of establishing CDBL is to provide CDS to add momentum to the growth and acceleration of our capital market. Problems such as fake, forged or lost shares, long settlement cycle, operational inefficiencies of manual clearing and settlement system, hassles of shares registration, transfer and certificate validation are still prevailed in the market and due to them, the investors felt disinclined to stake their money in such a volatile and shaky atmosphere. Under such circumstances, the Depository Act 1999 enabled and motivated the companies in private sector with joint collaboration from the government to set up a securities depository company. One can open securities account through a DP and start dematerializing his securities into his account and / or start trading in the electronic mode. The balances in his account are maintained with the depository and are available through the DP. His DP will intimate him the status of his holdings or transactions from time to time. 9 Any other capital market intermediary registered with the SEC. The issuer:- An entity that puts a financial asset in the market place. Exchange DP: – Provides service to brokers for settlement purposes. Trading participant:-Stock brokers/dealers (Stock Exchange member) who can operate their own account (principal account) and clearing account. Full service participant:- Participants who can operate their own account, clearing account and the accounts of investors. Custody participant: – Participants who can operate their own account, clearing account of stock brokers/dealers, custody account of their customers but it is not a stock exchange member. Settlement agent participant: – Participant who can operate clearing accounts on behalf of stock brokers/dealers for the settlement of stock exchange transaction. An Investor can avail many benefits if the Investor buy and sell in the depository mode. 3 No risk of loss, mutilation or theft of share certificates. 5 No stamp duty for transfer of shares. 6 Low transaction cost for buying and selling in the dematerialized segment. 7 Low Interest rates on loans granted against pledge of dematerialized securities by banks. 8 Pay – in and pay – out of securities on the same day. 9 Increase in the liquidity of Investors securities because of faster transfer and registration of securities in his/her account. 10 Instant disbursement of non – cash corporate action benefits like bonus and rights into Investors account. 11 Elimination of vault charges. If we consider the above findings, we will find that through Central Depository System (CDS), CDBL is going to provide a bundle of services and information to its Beneficial Owners viz. investors, brokers, issuers, stock exchanges, banks and regulatory authority (SEC). The system of Electronic Book Entry Transfer (BET) adopted by CDS basically replaces the physical shares and enables paper-less trading. The paperless or scrip-less trading will provide a number of benefits to the beneficial owners by eliminating the problems and hassles normally associated with paper based trading that is prevailing at present trading. There are a lot of problems such as fake, forged and lost shares, long settlement process, operational inefficiencies of manual clearing and settlement system, troubles and hassles of shares registration, transfer and certificate authentication etc are prevailing in the market at present. As a result, the investors felt hesitate to invest their money in present situation. CDS that is provided by CDBL will remove these problems and create a favorable environment through electronic share trading system. CDBL will be accountable for its operation to the regulatory authority; Security and Exchange Commission (SEC). Besides the different facilities, CDBL has some shortcomings, which might create obstacles in its smooth and efficient operation. By overcoming those drawbacks, CDBL will be able to ensure the Accuracy, Speed and Transparency for the benefits of all concerned. This will obviously have a good impact on the capital market of Bangladesh. Moreover, for improving the situation of the capital market of Bangladesh CDBL will be an advanced step that will add momentum to the growth and pace of our capital market. DSE is a forward-looking bourse of the country. Among the major steps and plans, DSE has taken various initiatives to meet the present challenges. For smooth trading operation DSE is now under process of introduce NGTS (Next Generation Trading System) into the existing engine to facilitate Equity market. The Clearing and Settlement module provides the management of trade from the point of entry into the Settlement Pool trade database until it has been delivered, settled and removed from the Settlement Pool. It consists of three major business processes. Clearing: participant trade reporting, affirmation, billing and assigning settlement instructions. Settlement: the process of overseeing that delivery of all instruments to the buyer and payment of all moneys to the seller has occurred before removing the trade from the settlement pool. Regulation 4 of the Settlement of Stock Exchange Transactions Regulation 1998 has been given effect time to time. A new directive was made by SEC dated on 18th March 2003 “Adjusted due position mechanism for settlement of scrip only as provided by regulation 4(1) of settlement of Stock Exchange Transaction Regulations, 1998 shall remain suspended from 19th March 2003 until further order”. 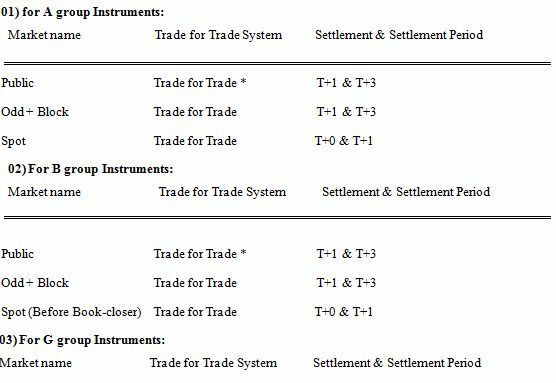 Here is a complete picture of the settlement system for all of our 378 Instruments in Five (5) groups in the Four (4) markets. A Group: Number of Instruments are 164 (142 + 8D + 14M), Here D for Debentures, M for Mutual funds & TB for Treasury Bonds (Trading in Public, Block & Odd-lot Market with trade for trade settlement facility for scrip only through DSE Clearing House on T+1, T+3 basis). “A” and “DA” are marked in BASES columns for Non-Demat & Demat instrument respectively in our TESA Trading Software. The above cycle is valid for A, B, G & N category instruments traded in Public, Block & Odd-lot market. 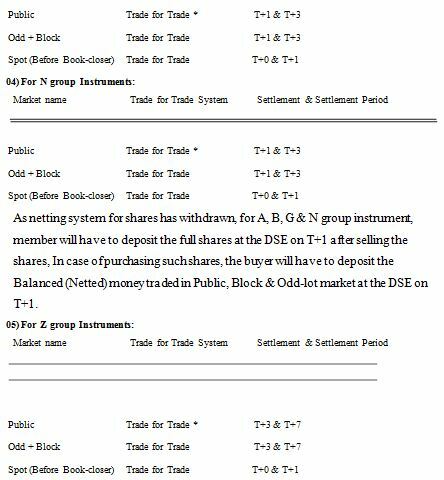 B Group: Number of Instruments are 18 (Trading in Public, Block & Odd-lot Market with trade for trade settlement facility through DSE Clearing House on T+1, T+3 basis). “B” and “DB” are marked in BASES columns for Non-Demat & Demat instrument respectively in our TESA Trading software. G Group: Number of Instrument is 1 (Trading in Public, Block & Odd-lot Market with trade for trade settlement facility through DSE Clearing House on T+1, T+3 basis). “G” and “DG” are marked in BASES columns for Non-Demat & Demat instrument respectively in our TESA Trading software. N Group: Number of Instrument is 14 (Trading in Public, Block & Odd-lot Market with trade for trade settlement facility through DSE Clearing House on T+1, T+3 basis). “N” and “DN” are marked in BASES columns for Non-Demat & Demat instrument respectively in our TESA Trading software. Z Group: Number of Instruments are 97(Trading in Public, Block & Odd-lot Market with trade for trade settlement facility through DSE Clearing House on T+3, T+7 basis). “Z” and “DZ” are marked in BASES columns for Non-Demat & Demat instrument respectively in our TESA Trading software. This cycle is valid only for Z group instruments traded in Public, Block & Odd-lot market. The above cycle is valid for A, B, G, N & Z category instruments traded in spot market. The above cycle is valid for A, B, G, N & Z category instruments of Foreign trade. If any instrument declared as Compulsory Spot then Trades of Block and Odd-lot market of that Instrument will be settled like Spot Market. Howla Charge, Laga Charge & Tax are always payable to DSE at Pay-In date for both Buyer and Seller traded in Public, Block & Odd-lot Market. Howla Charge, Laga Charge & Tax are always payable to DSE at T+1 day for both Buyer and Seller traded in Spot Market. Outside-Of-Netted settlement for “A” Group instrument has been withdrawn from 10th Dec 2006. DVP Trades are Off-Market Settlement (Broker to Broker). As netting system for shares has withdrawn, for A, B, G & N group instrument, member will have to deposit the full shares at the DSE on T+1 after selling the shares, In case of purchasing such shares, the buyer will have to deposit the Balanced (Netted) money traded in Public, Block & Odd-lot market at the DSE on T+1. Under the Trade for trade settlement system, member will have to deposit the full money at the DSE on T+3 after purchasing the shares, In case of selling such shares, the seller will have to deposit the full shares at the DSE on T+3. All selling shares have to transfer (Pay in) to the clearing account of selling Brokers from concerned BO account within settlement period. Regarding the cash payment the procedure will remain unchanged as mentioned above. If a member fails to deliver securities or make payment within the settlement day, the stock exchange automatically squares-up the unsettled transaction. This is done by buying –in or selling –out as required on T+4 on the risk and account of the defaulting member. No notice is given. Members are allowed to carry out spot transaction in DSE during the period of books closure of listed companies. Spot transaction is to be settled within the next trading day (i.e. T+1) with information t the Clearing House. Transaction of foreign buyer and /or seller involving a custodian bank is settled within the fifth day subsequent to the trading day, i.e.T+5, with intimation to the Clearing House. (i.e.T+2 and T+6 respectively) until the concerned trade is settled to the satisfaction of DSE and a fine of BDT 5,000per day in case of spot transaction and BDT 10,000per day in case of transaction of foreign buyer and seller, as the case may be for each default is paid to DSE. A GTC order is the order that remains in the system for a period no exceeding one-calendar week or the member cancels it. A GFD is the order, which is valid for the day on which it is entered. If the order is not matched during the day, the order gets cancelled automatically at the end of the trading day. A GTD order allows the member to specify the number to specify the number of day’s not exceeding one calendar week for which the order shall stay in the system. At the end of this period the order shall be deleted from the system. A FOK order is the order that will match for a trade at the Market Price only if the total quantity is available. A PFRK order is the order that will match for a trade at the Market Price for the quantity available in the market .The balance quantity, if any, will be converted to a Limit Order at the last traded price. An order in which the minimum quantity must be filled. Market order protection is a protection, which will ensure that the trade price for market orders shall be within a certain price band (depending on the market order protection value). For a market buy order protection value (which will be supplied by the member, when the market order is entered) will be relative to the BBO offer price and for a market sell order it would be relative to the BO bid price. A Drip Feed Order is an order in which the member has the option to specify a replenish quantity along with the total order quantity. Only the replenish is revealed to the market .The quantity gets replenished only when the previous quantity has got traded and every time the quantity gets replenished, the visible quantity gets a new time stamp. The price, volume, retention & client ID of an order can be changed prior to execution or fro many unexecuted portion of an order. Orders can be cancelled at any point prior to execution .All orders shall be automatically deleted fro the system once their time condition has expired. ii) Within Price, by time priority. The CEO in Committee of DSE will have the authority to suspend trading of specific securities, trading by specific members or permit the resumption of trading activities in the security by the member from the terminal. The matter however shall be informed to the SEC immediately within the trading day. Investors are allowed to quote their expected price I the three Buy/Sell order. The-trading system of the Exchange automatically matches the best prices. Before execution of an order, the investors through their brokers may revise the price. Therefore in broad sense, the market forces of demand and supply fix prices. Capital market is an integral part of developed and industrialization economy. One can hardly escape the impact of activities of the capital market or lack therefore on the economy. Ours is a nascent capital market, yet to mature and yet to go a long way. Dhaka Stock Exchange was established in April 28 1954 and eventually the automated trading system was introduced in both the bourse in 1956. The development has been quite considerable so far and the latest move to establish a central depository in the country also deserved wholehearted praise. (a) Problems faced by the Dhaka Stock Exchange. (b) Common problems these are discussed hereunder. After launching the automatic trading system, Dhaka Stock Exchange’s major problem has almost been solved. At present, there are no such major problems as was available during the Cry-out system. However, the following are the problems mentionable now faced by the Dhaka Stock Exchange. The real problem lies with physical transfer of shares. It has earlier been mentioned that, after automation, Dhaka, Sylhet are connected with Dhaka Stock Exchange and trading occurs at the same time. As a result, shares and securities are required to be sent/to take delivery from that region for settlement. It’s really a cumbersome work. Because, at the time of sending security, there attached a 178 form along with that security. The share/security is sent through courier services. Thought there is an insurance policy against the risks of transfer of shares; nevertheless, for avoiding risks, the clearing and Settlement department takes some actions. When they intend to transfer share to any regional office, they separate the 117 form and securities into two parts and putting them in two separate packets, they sent the same through two separate courier services. Reversal, in case of receiving of shares/securities, the said department gets two packets from courier services. One containing 117 forms and another containing shares. Then, they adjunct the respective117 form with respective securities. This is surely a time consuming and difficult job. At present, all share price index are used at the Dhaka Stock Exchange. But this is not a proper methodology. By using this methodology of calculating index, appropriate value of index can’t be ascertained. Dhaka stock exchange is functioning with very efficient, skilled and resourceful personnel. As all the systems are going on manually, hence, system department have to work much. In addition, they have or render services to various Broker Workstations to solve the technical problems of the BWS. As a result, more personnel are required for system department to reduce the burden of work. But, they are not getting personnel as per their requirement. There are some members, who, in fulfilling client’s demand, put order for forward buying/selling. It means to buy share without having sufficient fund and to sell share without having securities. This leads to that member firm towards squaring up and as a result, a complex situation arises. Like any other industry, people who invest or are involved in capital market activities, have not sufficient knowledge about the market and the product. Even, they don’t know how to make a valuation of a share. As a result, they have to suffer losses. What has happened to the capital market in the recent past, have vividly demonstrated lack of knowledge all around thus resulting negative impact in every respect. The environment around the capital market is full of rumors of scams and wrong dealings. Brokers are accused of manipulating prices; companies are accused of miss-pricing their stocks, of floating rumors and of misrepresentation of performance. It is impossible to determine the validity of these accusations. Most of the members of DSE are not rendering optimum services to the investor’s. • Some stock exchange members also serve as director of listed companies. This can lead to the chance of insider trading especially in such a poorly regulated market. o Certifiers of financial statements and Property values of the company are the identical. o Corporate governance – sponsor-owners are managing the firm. All most all cases, no professional management are hired to run the affairs of the listed company. • There has been general allegation by the investors that there has been some fraudulent acts insider trading which may have contributed to the abnormal fluctuation the pries of transparency, systematic deficiency and management inadequacies in the conduct of the trade by the stock exchange. To solve the problem associated with physical transfer of Shares, CDS should immediately be introduced. It will ensure proper monitoring; eliminate forgery of share documents, apart form giving the speed of doing business in the capital market. Without CDS the automated system will remain under-utilized. To bring efficiency in the market, particularly with ever increasing trade volume and to derive maximum transparency, CDS should be implemented as soon as possible. To make appropriate the methodology of index, selective index should be calculated instead of all share price index. This program should be run immediately to find proper price index. More technical expert is to be appointed for system department to minimize the work burden. The broker should provide short-term credit line for the investors, so that the investors can buy shares without depositing fund. For this purpose investors be rated particularly the institutional investors to determine Client’s credit Worthiness. Dhaka Stock Exchange Broads must allow all operational decisions. The dormant members of stock exchange should be surveyed very strictly. Such members should be compelled to either trade or give up their membership. Market makers create both demand for & supply of securities and to the consistency in the prices. So it is recommended to make necessary provisions in stock exchange by laws for permitting market maker’s activities. To minimize the chances of insider trading legal provisions should be made that, no stock exchange member would be allowed to become directors of any listed company. In Bangladesh, we should follow the practices of developed capital markets & not allow curb market anywhere. The average investor must have access to all information that might help the right investment decision. SEC can institute either a set up or to encourage the formation of investors associations under its umbrella. Credit rating enables the investors to judge the viability of the company for investment. Bangladesh capital market can accommodate some credit rating agencies. Two stock exchanges are in operation in our country – Dhaka stock exchange and Dhaka Stock Exchange. The establishment of Dhaka Stock Exchange introduced a new horizon in capital market of Bangladesh. The remarkable progress of the last 10 years of Dhaka Stock exchange has been made possible by the co-operation and assistance of its very skilled personnel, members, SEC, the listed companies and other associated participants in the stock market. DSE is a nonprofit making organization. I am incorporated on 1954 as a limited co. by guarantee on 1956, floor trading was made with open cry- out auction system. Now DSE is a completely automated exchange with screen based trading facility on countrywide communication network. The automated trading system of Dhaka Stock Exchange has removed all the limitations of the traditional ‘Cry-Out’ system. After launching the automatic trading system, Dhaka Stock Exchange’s major problem has almost been solved. At present, there are no such major problems as was available during the Cry-out system. Now trading has become automated, lead by DSE through central depository .The central depository Bangladesh limited (CDBL) was create in august 2000 to operate and maintained central depository system (CDS) of electronic book entry, recording & maintaining, securities accounts and reregistering transfer of securities. The objectives of establishing CDBL is provide CDS to at momentum to the growth and acceleration of our capital market. Under such circumstances, the depository act 1999 enabled and motivated the companies in private sector with join collaboration from the government to set up a security depository companies. DSE practices a daily netting system for its settlement. Members receive a net off statement on every trading day in the post closing session. Settlement system is the process in transferring money & shares of executed trade of buying & selling broker in a stock exchange. IT is an intermediary act as common agent. Stock exchange fixed the settlement period by which & executed trade must be settled. From the forgoing discussion it can be said present automated trading environment, bids /offers, depth, required broker particulars are all recorded and can be retrieved for future reference. A developed market economy is always accompanied by a robust stock market. Since Bangladesh has adopted free market economy as her national policy to achieve her goals of higher growth and rapid privatization, she must revive her stock markets and make them capable of working as the main vehicle for mobilizing and allocating funds needed to finance the industrial and other development activities of the country. In fact, no alternative path is suitable like a stock market to strengthen the financial base of a country, gear up its development activities and achieve its all-out economic emancipation. Dhaka Stock Exchange has been eminently supportive in many ways in this journey of capital market development in Bangladesh. In this brief span of its existence DSE has played a noteworthy role in the development of capital market in Bangladesh. DSE contribution is enormous in shaping where we stand now and success of DSE in this journey of development of capital market in Bangladesh largely depends on how it run its Trading System. Deposit Analysis of National Bank Limited.